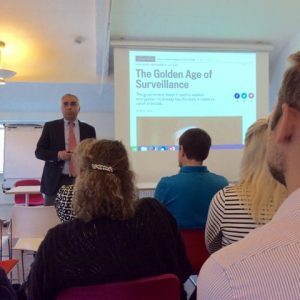 On the 13th of June, UN’s new privacy rapporteur Joe Cannataci visited Copenhagen, D enmark for the first time in his term as rapporteur, to discuss business practices’ influence on the individual’s right to privacy. He was invited by DataEthics.eu and the Danish Institute of Human Rights. At the morning workshop with representatives from key organisations and leading experts in Denmark, he pointed out that there is actually no binding and universally accepted definition of privacy. And this in fact impedes the legal enforcement of the right to privacy. Because how do we regulate a specific business conduct, such as for example a business’ predictive analytics tool used on big data collected on customers, if we do not have the same understanding of the problems it arises in regards to the individuals’ right to privacy? What Joe Cannataci is referring to is that even though we do formally have a right to privacy that is described in internationally agreed conventions and declarations, including the right to data protection, we have never formally agreed upon the very content of this human right. We’ve silently and unformally agreed upon a variation of culturally (and heavily interest driven) definitions. In the Internet commercial era, we’ve for example accepted the terms and conditions of the “Digital Declarations” (to quote the retired, but still very active, Harvard professor Shoshanna Zuboff) made by the big data corporations (and governments) without questioning their roots and embedded interests. So we are left with all these competing definitions which at best leaves us (the citizens and the enforcers) numb. Before the advent of the internet, privacy was the absence of interference from states (in human rights legal language a “negative” right). We slowly found out that this also included “positive obligations” of governments to ensure this right in law and enforcement. These obligations were defined and tested in a range of legal cases (check out e.g. the case law of the ECHR). And we’ve added legal instruments such as the GDPR or convention 108 in Europe. There is a rising movement within business development that is responding to the privacy needs and demands of individuals. These new businesses are innovating from the point of view of the individual. A strangely enough new definition of privacy, but only strange because it is actually a new thing to take into account the “privacy needs” of the individual when privacy is defined in the corporate world and society in general. And its even done in a very business like manner. The privacy demands of the individual are by these businesses prioritized just like any other customer demand that a business normally would cater to when it explores the market, innovate and develop. We are for example seeing new business models that are not based on the monetization of personal data. New tech developed to minimize data collection, not maximize it. Ethical businesses that go beyond the mere compliance with the law. Innovation driven by privacy by design principles. These new businesses will take part in the construction of a formally binding universal definition of privacy.